(Phys.org) —James Cook University conservationist Jonathan Colby has published a Correspondence piece in the journal Nature, warning of environmental damage to the unique wildlife on the island of Madagascar, due to an invasive species: the Asian common toad. He suggests a program be implemented as quickly as possible to eradicate the toads before they cause irreparable harm. Most everyone knows that the plants and animals on Madagascar are unique, which makes them precious. The flora and fauna that exist on the island came to be unique due to isolation, but in the modern world, that isolation is being threatened as ships arrive, sometimes with hidden cargo. In this case, it's the Asian common toad, a creature with toxic substances in its skin. Snakes and other animals that eat the toad can become ill, or even die. Another threat to the unique creatures that live on the island is the appetite of the toad, it will eat amphibians, rodents and snakes—easy prey on Madagascar as such animals have not developed a natural means of protection against such a predator. 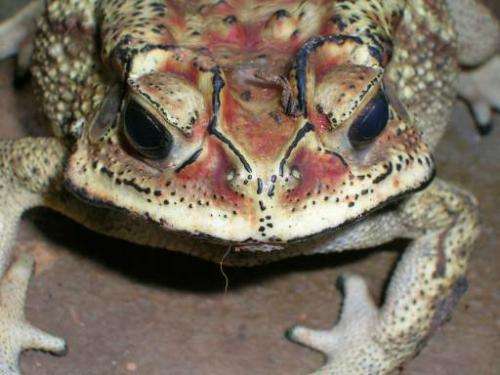 There is also the fear that the toad could cause the spread of diseases, such as the chytrid fungus and ranavirus, which have been found to cause the extinction of amphibian species in other parts of the world. The toad was first spotted by workers at a mining company—upon hearing reports of an alien toad, Kolby rushed to the scene and found he was able to capture six of the toads, which suggests a lot more are present. The sightings and captures were near a port which means the toads were likely stowaways on merchant ships, likely as far back as 2011. Kolby is calling on the environmental community (and the government of the Republic of Madagascar) to take action to eradicate the toad from the island before it becomes too difficult a task—failure to do so, he notes, would likely lead to serious ecological damage. Ways to get rid of the toad would include capturing and killing adults (and disposing of them elsewhere to prevent contamination of drinking water), removing eggs and larvae in places where they breed, draining ponds where they are known to lay eggs and installing fences to prevent the toads from reaching such ponds in the first place. Asian common toads (Duttaphrynus melanostictus) have begun to invade Madagascar, threatening the biodiversity of its unique fauna. Time is short, so we are issuing an urgent call to the conservation community and to governments to prevent an ecological disaster. "James Cook University conservationist Jonathan Colby has published a Correspondence piece in the journal Nature, warning of environmental damage to the unique wildlife on the island of Madagascar, due to an invasive species: the Asian common toad. He suggests a program be implemented as quickly as possible to eradicate the toads before they cause irreparable harm." "James Cook University conservationist Jonathan Colby has published a Correspondence piece in the journal Nature, warning of environmental damage to the unique wildlife on the island of Madagascar, due to an invasive species: the common HUMAN. He suggests a program be implemented as quickly as possible to eradicate the HUMANs before they cause irreparable harm."